Venture to the Northern Region of Nicaragua, home of the best surf in Central America and experience an opportunity to excite and unite your body, mind & spirit while connecting deeply to nature and others. August is prime season for surf, sun, lush tropical vegetation & ideal weather conditions on the coastline. Imagine a week where...scratch that, SIGN UP for a week of adventure, fun, rejuvenation and growth. Not all yoga retreats are incense, chanting and 5:30am wake-up calls (although we do love this!) Sneak away with us and recalibrate your sense of self by connecting to community, nature and your greater callings through an epic week in Nicaragua. 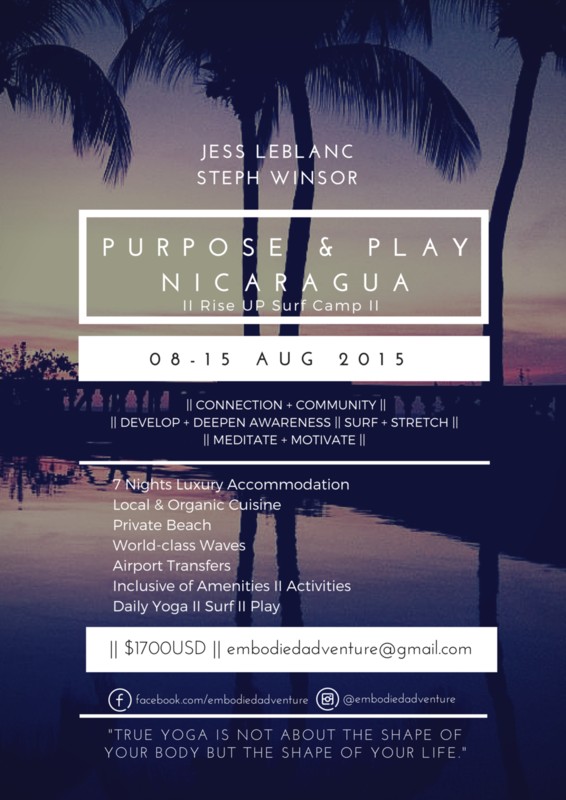 This “Purpose & Play” oriented retreat will provide you with copious laughs, sweats, centering and wholeness. Both teachers and coaches, Jess Leblanc and Steph Winsor will provide perspiration and inspiration through twice daily yoga (ignite + restore), powerful meditation, goal coaching and perspective shifting conversations all while in supportive community. There is no such thing as average at Rise UP Surf Retreat Center. During this week we will engage in tangible activities as well as palpable shifts that will move you toward your True Center and help you articulate your greater purpose. Goal Coaching isn’t about coming up with new to-do’s but instead connecting and illuminating your natural self! We believe you all have a greater power than you have ever imagined. Jess and Steph know that yoga and meditation are powerful gifts that ignite and unite the Body to the Mind + Spirit. This week will give you tools to either start or advance your yoga, mediation and breath-work practice at home or in community. With a focus on wellness, health and happiness, every ounce of energy spent at this retreat will help you heal, believe in your potential and act on your greater purpose. All while enjoying lots of play + pleasure, it is a vacation guys! ** prices for Add-Ons are available on request! This Purpose & Play experience is open to all levels and non-yoga partners are also welcome. You are the master of your own destiny, ALL activities are suggested but ultimately optional! Retreat price DOES NOT include flights, travel insurance or 'add-on' excursions/activities mentioned above. Send us an email embodiedadventure@gmail.com for any additional information and to set up payment!